My So-Called Undeath: What Happened to Karen? I've never read anything by Daniel Waters before, nor have I ever read a book on the undead. Maybe I will though, now that I've seen one here . . . I can't wait to find out what happened to Karen! I love her! OMG im on my way to go get it now!!!!!!! Yay!!! im going to go get it asap!!! is this the 3rd book in the series? is this the 3rd one? 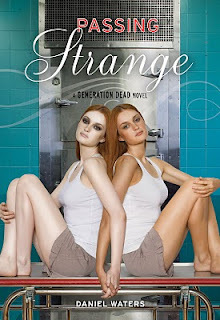 is that the next book in the series Generation dead? like the second or third ect.? OMG this was like the most AMAZING book I have Evvvvvvvvvvveeeeeeeeerrrr read and I hope theres another book! Don't know yet, but she probably isn't dead. She couldn't die Tommy. She has got to be hiding somewhere. Right? omg!! cant wait for this book! what's happening to karen?!... plz tell us!!! what's happening to karen?... plz tell us!! I know what happened to Karen!! I got the book the day it came out and am already on chapter ten!! Karen can't be reterminated. She just can't. She's got to be passing for traditionally biotic somewhere out there. I can't wait to get my hands on a copy of the book and find out! Yay! It was soooo good!!! Write another one please!!! Karen is definately NOT living impaired anymore. Her heart started to beat again! Can't wait to read more! The book is already out? I only just now got "Kiss Of Life." I'll read fast, Karen is intresting to read about. - L.J. Just got the book and I love it so far I can't wait to finish it!! She just had to be gay. I just finished reading "Kiss of Life" and the obvious chemistry between Takayuki and Karen was undeniable! Karen is telling first chapter in "Passing Strange". Anyways, I wish Karen will find Tak so they can be together. Read it and couldn't put it down. I love Karen's point of view. It was deffinitely interesting and different. Hope there's another one! :) Oh and by the way Tommy, good luck. what happens to Tommy and Phoebe?? screw Karen (but i do love her! dont get me wrong!) phoebe needs to leave adam and go out with tommy!! I want to read it so badly I just love the books they are the best I tell all my friends about it. And all they do is tell me that I'm weird and that I need a life and that these books are stupid. And I just tell them to read it and then tell me how they like it!!! But, anyway I love the books and I love Adam!!!!!!!!!!!!!!!!!!! Will there be a 4th book? If so will it be about pete and julie? WHEN THE HECK IS IT COMING OUT!? Just fininshed the new book and man oh man was I blown away. I find Karens strength more appealing then ever before. I adore her and find her struggle so human. Tommy- you keep doing what your doing and get some relief for your firends. Especially Tak and Popeye. UGH, my library doesn't have this yet, but i gotta find it! i didn't know this was out, i FINALLY checked this website for the first time. I just finished this book a little bit ago and i must say that i loved it. The story moved me in ways that a lot of books can't anymore. I feel closer to karen, you, and everyone else in the stories. The generation dead series rocks!! I can't wait to read the third book and find out what happened to Karen!!! I just finished this book today. WOW. I just finished this today. Wow. The end left me wanting so much more. Also, I absolutely love Takayuki. i hope nothing bad has, and i hope to find out ASAP. but, im glad adam is now with pheobe, hes been in love with her for far too long and now they are both together and happy. Also i know tommy loves her very much too, so im curious as to whats gana happen next. lets just see where this road leads for them, all of them in the next book. I just finished it and I must know what happened! I completely think that Julie is a zombie. All the way. I've read all of the "Generation Dead" novels. And I love them!! <3 I love how he makes it seem like you're in the characters' mind. What happens to Karen in the end of "Perfectly Strang" is a BIG shock. but you kind of notice that she is. If you haven't read it and you're reading this, I reccommend it HUGELY. You will really enjoy it. Oh my god... it almost looks like she's ALIVE! I must know what happened. Ordering the book RIGHT NOW! i have only read the first book and u am flipping out,i'm so confused need to find some money!!! so interseting to see it through Karen's eyes! What DID happen to Karen? She didn't die did she? No one knows! I hope she's ok.
i <3 this book i just finished the 1st 1 like 2 to 3 days ago it was the best book ive ever read!!!!!!! I just found out about these books like two weeks ago. Everybody at my library wants it. It's SOO hard to track down. But I read the last two in like three days! I love love loveeeeee Karen! i just read both books i normally don't like reading but i could not put the books down!!!!! i still have 2 get the 3rd is there only 3 books???? and it was all three of them!! !My favorite was prob. Generation dead because I love Tommy, and I want him and pheobe to get together!!!! omigosh! i cant wait to get the new book. how do i join the wall. im a trad but tht doesnt matter around here does it? i know-i have only just started reading passing strange so i want to know to. how can you not have read any daniel waters that is what this is all about duh!!!! OMZ! the third book was AWESOME I couldn't put it down and I can't get over the ending I NEED to know what happens next!!! OMZ! Did Karen do the whole suiccide thing again? I hope not! As I said, everything went to hell and Pete had everything to do with it. Is she okay, and is everuone safe? Please find out for us!! And beware of the white vans, Tommy. It's a more important rule now then it's ever been before.